VETgirl wants to give a HUGE shout out to Zoetis for sponsoring a FREE Facebook LIVE webinar on "Panting, pacing, vomiting...is it all in the dog’s head? Distinguishing motion sickness from car phobia"
VETgirl and Zoetis have made the recording available to you! 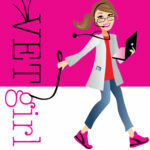 If you are a VETgirl ELITE Member, you can also get CE credit for this webinar! This program 785-32546 is approved by the AAVSB RACE to offer a total of 0.5 CE Credits being available to any one veterinarian: and/or 0.5 Veterinary Technician CE Credit. This RACE approval is for the subject matter categories of: Category One: Scientific using the delivery method of Seminar/Lecture Interactive-Distance/Non-Interactive-Distance. This approval is valid in jurisdictions which recognize AAVSB RACE; however, participants are responsible for ascertaining each board's CE requirements. RACE does not "accredit" or "endorse" or "certify" any program or person, nor does RACE approval validate the content of the program. Thank you so much for making this recording available. Passive CE is only available for VETgirl ELITE members – if you are a member, please make sure you’re logged in! Thanks!